From July 10–16 2017, The Cincinnati Enquirer sent more than 60 reporters, photographers, and videographers on assignments to document the lived impact of the region’s opioid epidemic. What they produced was a groundbreaking portrayal of the epidemic’s extent in the course of a week—an almost hourly report on the experiences of addicts, survivors, family members, doctors and nurses, law enforcement officials, and organizations who have all been affected. Within a week of publication, “Seven Days of Heroin” received over one million views and drew praise for its detailed, multi-genre coverage. Combining video, on-the-ground dispatches, social media commentary, and a day-by-day count of overdoses and deaths, the piece is a powerful and thoroughly original testament to the work of journalism in community. 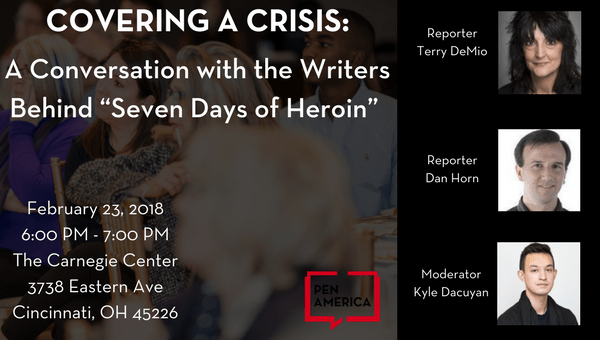 Thanks to all that joined PEN America and two of the reporters, Terry DeMio and Dan Horn, for this conversation touching on the story’s development and response, as well as the need for continued journalism addressing the issue. Terry DeMio is the heroin reporter for The Cincinnati Enquirer, where she has covered the heroin epidemic as a full-time beat for two years. A journalist for 25 years, DeMio lives in Northern Kentucky. Dan Horn is the Hamilton County reporter for The Cincinnati Enquirer, and has over 20 years of experience covering government, courts, business, and breaking news. Kyle Dacuyan is the Senior Manager of Literary Outreach & Activism for PEN America. In this role, he engages the literary community in a diverse range of activist opportunities; facilitates partnerships with cultural, community, and advocacy organizations; and supports the curation of PEN America’s literary content and programming.